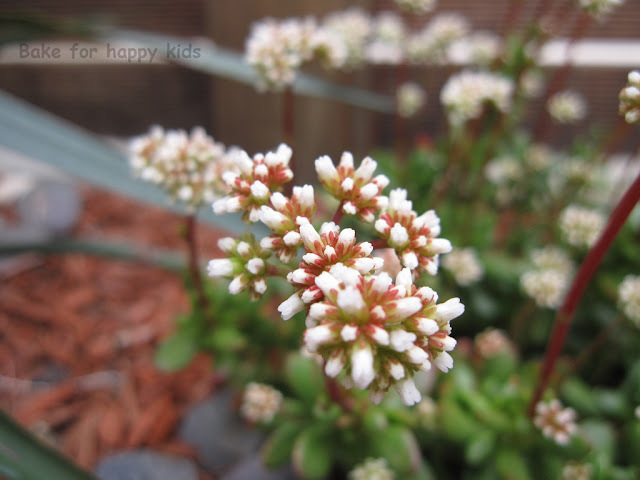 As I was hanging out with my family at our front garden, we noticed that even our drought-tolerant succulent plants (aka "survivor series" from Bunnings LOL) are blooming with flowers. Nice! 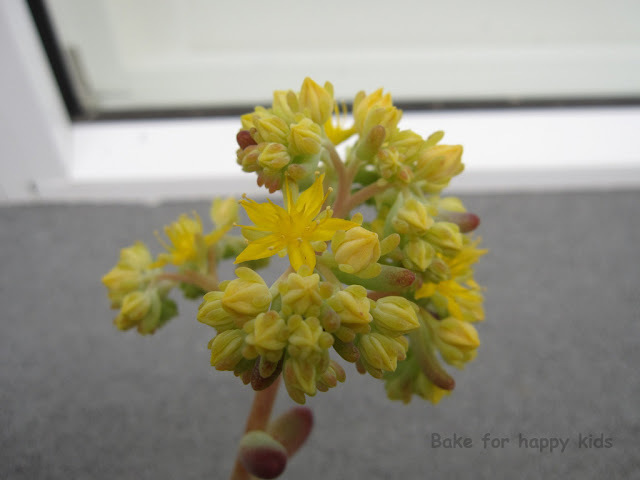 The white and yellow flowers has inspired me to make meringue kisses with lemon curd. I doubled the amount of ingredients and made the extra batch into pink meringue kisses with strawberry white chocolate filling. 1.Preheat oven to 150°C/130°C fan-forced. Line 2 baking trays with baking paper. 2.Using an electric mixer, beat egg whites until stiff peaks form. Add caster sugar. Beat for 8 minutes or until sugar has dissolved. 3.Place mixture into a piping bag fitted with a 5mm fluted or plain nozzle. Pipe 2cm wide swirls of mixture onto prepared trays, allowing 2cm between each for spreading. Bake for 8 to 10 minutes or until meringues are firm. Turn off oven. Allow to cool in oven with door slightly ajar. 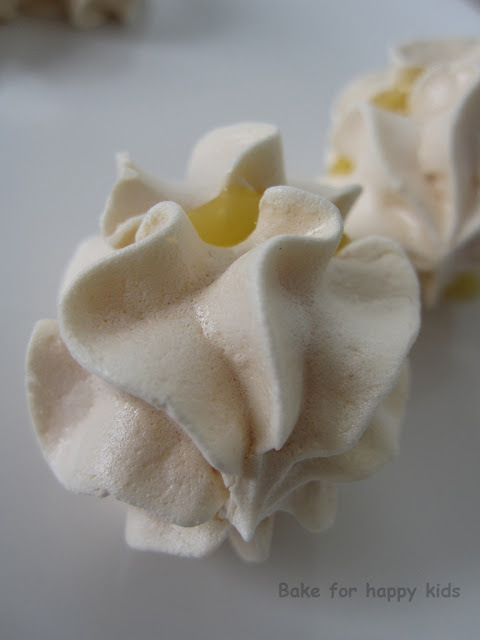 4.Sandwich 2 meringues together with 1/2 teaspoon lemon curd. 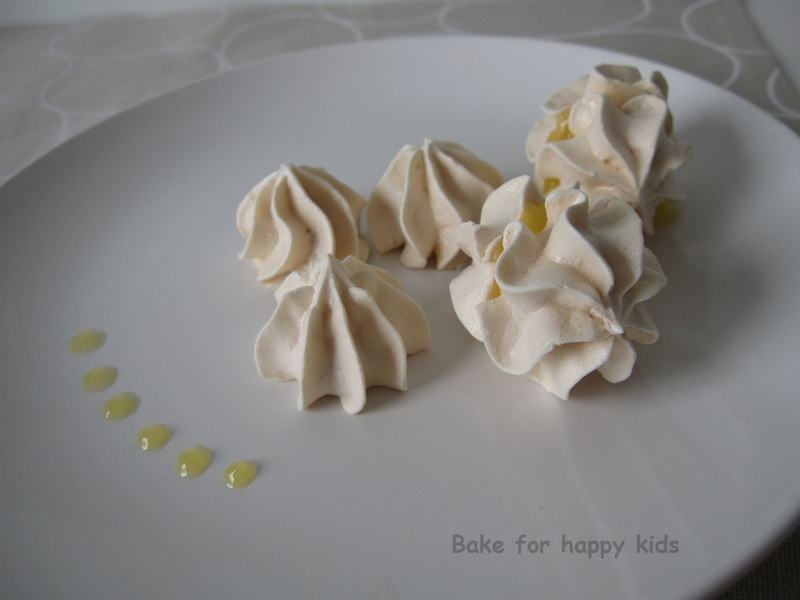 Repeat with remaining meringues and lemon curd. Accordingly to Australian Woman Weekly, Macaroons and biscuits cookbook, they bake their meringue at 120°C for 1 hr and so I thought of baking the meringue like what they did. In fact, this method works better accordingly to my taste because the meringue is crisper and melt in the mouth instantly. I've added a few drops of red colouring into half amount of meringue and notice that the supermarket-bought watery colouring changes the meringue consistency and piping is not as pretty as the non-coloured ones. I was thinking that I wouldn't need that much of colouring and so I used the watery kind. I should have use the professional gel colouring instead. The lemon curd that I used was bought from Safeway Woolworth. As for the strawberry filling, I cheated by making it the lazy way. Instead of pureed and sieving the fresh strawberry or raspberry into the white chocolate ganache, I melted 20g white chocolate and add 1 tbsp of weight watcher strawberry jam (less sweet)...Ta da..and it tasted ok! so pretty, hope I can have some :). Hi Zoe, thanks for stopping by my blog earlier and nice to meet you. 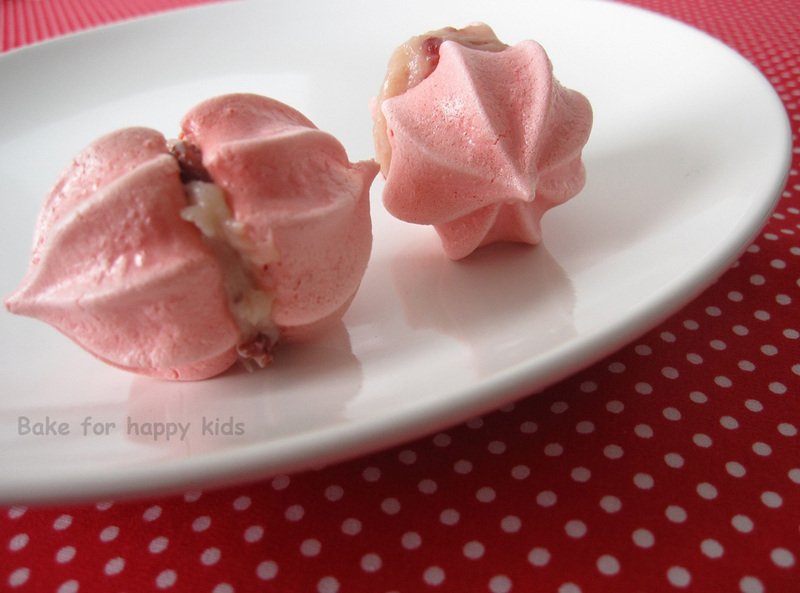 You have a lovely blog here and these little meringues look really awesome. Thanks for sharing. Bookmarked this for later use. Have a great day and hope to hear from you more often. Jess, Olive, 茄子 and Kristy: Thanks for all your comments.